Earn CEU’s for ICF approved coach training programs that will help you and your clients manage life transitions using the Seasons of Change, by Carol McClelland Fields. Training courses taught by Karin Marcus. Do You Work with Clients in Transition? Do your clients feel lost and confused about their future direction? If so, they are in transition--ending an important phase of their life or stepping into a completely new era. It's likely their friends and loved ones are giving them advice or pressuring them to take actions that are counter to your clients' inner truths. Your job is to help them sort out their situation, find ways to make sense of their circumstances, decide what actions to take, and motivate them to continue moving through this difficult time. On a good day, you are clear, your questions are helpful, and you feel good about the outcomes of the day. At other times, you feel in over your head, not sure where to go with your clients nor how to support them in their journey. Imagine having access to a rich metaphor that not only helps you identify what phase of transition your clients are in, but also what tasks they need to focus on to move forward and what actions are likely to result in disappointing, time consuming detours. Imagine sharing a key piece of the metaphor with your clients and hearing them breathe a sigh of relief as they feel heard and honored for being right where they are. Imagine the referrals you receive because your clients feel so supported by your work. You may wonder why other transition models don't touch clients at such a deep, soulful place. Often transition models are very conceptual--clients get the concepts mentally, but they aren't able to integrate the ideas into their lives. Although these transition models provide very useful frameworks to understand transition, they don't become an integral part of your clients' approach to life. The transition model we teach is useful whether your clients have entered their transition by choice or by force, whether the transition was anticipated or came as a complete surprise. The Seasons of Change is a rich multi-faceted nature-based metaphor that provides you and your clients with a natural way to approach life changes. Nature has developed a wide range of responses to the ever-changing seasons. These responses provide a rich foundation of knowledge, inspiration, hope, and direction to those in transition. 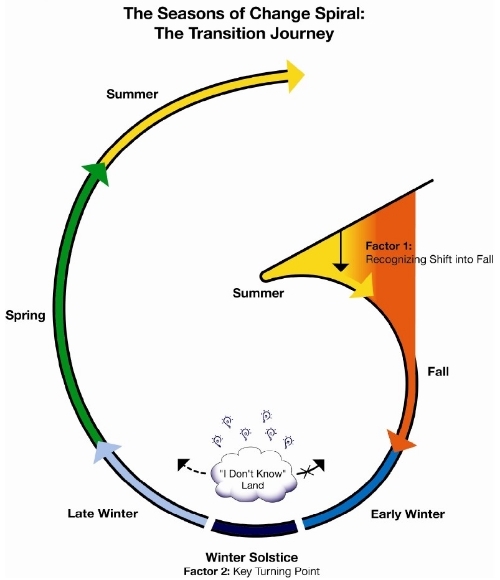 Each season (or phase) of the transition process has its own signs, actions, and detours. This information gives you a map you can share with your clients to show them the way through their transition. The visually memorable nature metaphors associated with each season are simple, powerful tools that give clients constant support and guidance through difficult times. By using this model in your work with clients, you give them hope--helping them envision where they've been, where they are, and where they are going. A process that is full of unknowns becomes a bit more understandable. Supporting your clients in where they are is a profound experience that deepens their trust in themselves, in you and in the transition journey. It's likely no one else is honoring them for what they feel deep within. Carol McClelland, Ph.D. birthed the Seasons of Change in 1992 and wrote the book of the same title in 1998. Having always been an avid observer of nature and wildlife, Carol turned to nature to make sense of a series of transitions that occurred in her life in 1986. Soon after she graduated with her PhD from Purdue University, she moved cross-country to California to start her first full-time job. Four months later her father died. Nature provided Carol with the clues she needed to navigate and heal through her transitions. Since creating the model, Carol has not only used the Seasons of Change in her work with clients in personal and professional transitions, she has spoken about the topic extensively to helping professionals and individuals. In early 2004 Carol launched the Seasons of Change Training for Professionals for therapists, coaches, and other transition professionals who support individuals in transition. Now, The Seasons of Change Training Program is taught by Karin Marcus PCC. Karin Marcus is a Professional Certified Coach with the International Coaching Federation, a Coach U Certified Graduate, and a Master Certified Retreat Coach. She has also trained with Carol McClelland PhD to become a certified Season of Change and Purpose Clarity Coach. Karin’s personal coaching style combines her love of the outdoors and respect for the human spirit. Her goal is to help everyone become an environmentalist of the heart. The Seasons of Change transitions module speaks directly toward this purpose and enables Karin to incorporate the wisdom of nature into her work with individual clients, as well as in outdoor retreats, support groups, and adult education classrooms. She is eager to once again make this valuable and pliable training program available to coaches, therapists, counselors and other professionals who support clients in transition. I’m so glad The Seasons of Change training program is coming to life again Since Karin became a certified Seasons of Change coach in 2006, she has integrated the model into her retreats, her workshops, and her “walk and talk” coaching work. From our earliest interactions I could see that her connection with nature allowed her to resonate deeply to my Seasons of Change transition model. Not only is she a natural at applying the model to client transitions, she often discovers new insights and metaphors in her personal journey and in her client work. Having done the same in the eighteen years since I created the model, I know she’s fully integrated the model into how she lives and works.